Calm before the storm? Went over to the Harbor and watched the boats from Boston Sailing Center out racing. Looked like a perfect day. The principal mission was to check Averisera before the predicted storm arrives. Of course, the boat is fine. 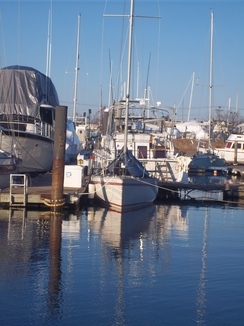 Being tucked in to Admiral's Hill Marina could hardly be more secure. Next sail? With any luck, January 1st we'll sail in the Constitution YC's New year's Day Race. For US East Coast sailors, the Caribbean racing season is as good as it gets. Flights to the Caribbean from the US East Coast are reasonable. It is not too hard to sail the boat from here to there. Service such as Dockwise can convey your yacht on their ship. Puerto Rico and the US Virgin Islands are easy to access US territory with top quality yacht services. Additionally, just about every yacht service known is available in St Martin, Antigua, Grenada, and Trinidad. The Caribbean is anything but remote. Racing starts in earnest on New Year's Eve and wraps up in May, around Memorial Day in the USA. In 2005 and 2006, Norm sailed the circuit. The circuit then comprised fewer than a dozen events of which four were major These days, the circuit is about three times the size and includes 17 significant events for keel boats. In the process of racing the full circuit, one would cruise the Eastern Caribbean. The full race calendar is found at the Caribbean Sailing Association web site. Check out the Swan 48, Patriot. She's got the program all set up. Get to Antigua by mid-December. As Don Street points out, leave the US from ports South of Cape Hatteras for a safer trip. The Averisera crew will attest to the wisdom of Don Street. December in the Atlantic, South of Hatteras and East of the Gulf Stream is pretty good. The other side of the line can be "challenging." "Plan A" is USEC to Antigua in December. Then we go Antigua to Barbados to Antigua to Grenada to Antigua to St Martin to St Thomas to the BVI to St Barts to Guadeloupe to Antigua to St Martin or Barbados and finally back home to the USEC. Whew! In all that sailing there is only one really tough leg, BVI to SXM. Crossing the Anegada Passage is crummy. The writer argues that it is one of the world's worst short ocean passages. Not that the writer has made an exhaustive study of the subject. You get the idea, though. Since we are talking about six months of the world's best sailing, throwing in a day of grumpy sailing seems reasonable. Sail home to the US East Coast. San Juan to Palm Beach is a pleasant reach of about a week's duration. Antigua to Palm Beach adds a few more days and at a better sailing angle. Hoping up the coast with the Gulf Stream and typical SW winds is a pleasant ride. When Norm was a young kid sailing the Bahamas in the 1960s, the Caribbean was out of reach it was so remote. Later, as a young man in the 1970s the Caribbean sailing consisted of a couple dozen crewed charter yachts such as the one's Norm sailed: Gitana IV, Sorrento, and So Fong. By 2004, when Norm went down to race all winter on Rumor, the West Indies were hopping!